Michael O’Shaughnessy is a lifelong resident of Brockville, Ontario which is the County Seat of the United Counties of Leeds and Grenville. He was educated at McMaster University in Hamilton, Ontario where he received the Bachelor of Arts degree in 1972. He then attended Queen’s University in Kingston, Ontario where he received his Bachelor of Laws degree in 1975. He was called to the Bar of the Supreme Court of Ontario in 1977 after articling with Michael Wadsworth an eminent criminal lawyer in Toronto, Ontario. He is a member of the Leeds and Grenville Law Association and a past-President of that Association. He is a founding member of the Rideau St. Lawrence Ontario Criminal Lawyers Association and currently the President of that association. He is a founding member of the Leeds and Grenville Collaborative Family Law Association. 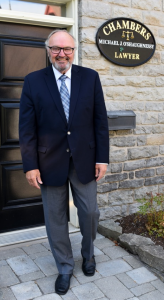 He is a member of the Law Society of Upper Canada, the Ontario Criminal Lawyers Association, the Brockville Rowing Club, and a director of the Lanark, Leeds and Grenville Addictions and Canadian Mental Health Association . He maintains contact with both universities that he attended. He played football with the McMaster Marauders and the Queen’s Golden Gaels. He was an “All Canadian” Defensive End in 1971 and drafted in the first round of the Canadian Football League. Rather than take advantage of this opportunity he attended Law School at Queen’s University where he continued playing football. It was playing football where he first learned to assert a vigorous, hard hitting defence. Mr. O’Shaughnessy’s office is located in the core of Historic Downtown Brockville at 17 Court House Square, directly across the green from the County Court House.